On this webpage emus strut, kookaburras laugh and eagles soar. 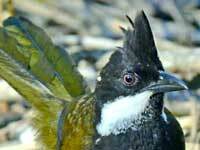 25-30cm (10-12 inches) is the arbitrary minimum size of Larger Birds. This is measured from bill tip to tail tip. The second part of the webpage are the birds of prey which besides eagles and falcons, also includes owls. There are over 40 members of the birds of prey group. 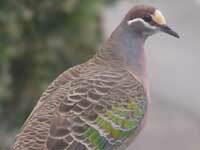 The aptly named Common Bronzewing can be found throughout Australia. 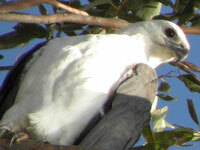 The female has a grey forehead compared to the male's cream forehead. The male Satin Bowerbird doesn't gain his shiny bluish black feathers until he is 7 years old. 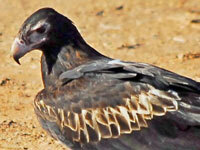 In his earlier years he can be distinguished from the ladies by his white beak as shown in this image. 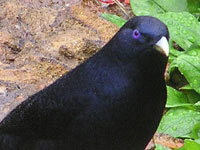 The Satin Bowerbird has the most vivid blue eyes. 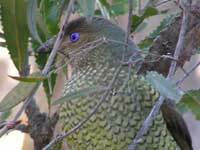 The bowerbird nest is not the bower, but a "real" nest in a tree. 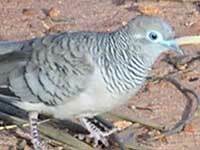 The Peaceful Dove is found in the eastern states and the north of WA and the NT. The light blue circle around its eyes easily distinguish it. It is a ground forager. Found in most parts of Australia, its wings make a distinctive woop, woop, woop sound when taking off. Found in forests along the coast and ranges from Queensland to Victoria. Often on the ground and in pairs. 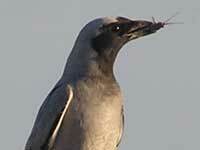 The Black-faced Cuckoo-shrike is found throughout Australia. This fellow has just caught a grass-hopper. This image, taken in Lane Cove NP, shows the marvellous back pattern. 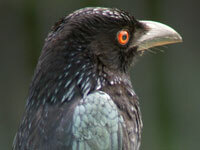 I was delighted to read in Wikipedia that "the spangled drongo is the only drongo to be found in Australia". Its flared tail identifies it. 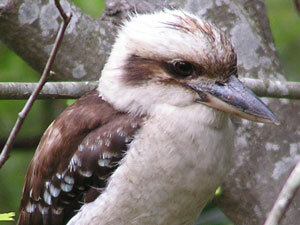 That most Australian of birds - the Kookaburra. Its laugh always makes me smile. 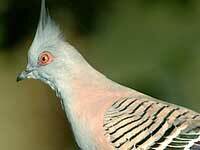 Endemic to Australia, and "introduced" to Tasmania and WA. 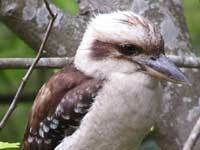 See our Laughing Kookaburra profile. The largest Australian bird, found throughout Australia except for Tasmania. Here's an image, taken in Coffin Bay SA, showing three juveniles with their mum. Found in wet forested areas and coastal scrubs from Cairns to Melbourne, its distinctive whip cracking call identifies it - although it is more often heard than seen. 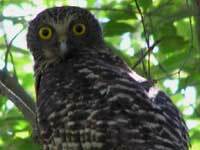 The largest owl in Australia, and apparently the only owl that has the standard "hoot hoot" call. To hear its call, and learn much more, visit the excellent Owl Pages website. It is a threatened species. 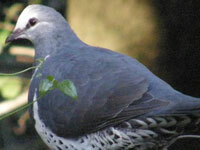 Bearing the distinctive hooked beak of a bird of prey, the Pacific Baza was formerly called "Crested Hawk". 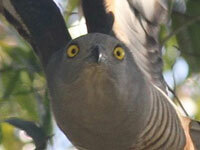 It can be identified by the crest on its head - and of course its yellow eyes, grey head and shoulders, and striped body. 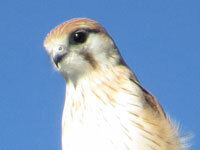 With the tell-tale dark tear of the falcon, the female Nankeen Kestrel has a brown crown, while the male's is grey. Here's an image of the male. Found all around Australia, except for the arid regions. 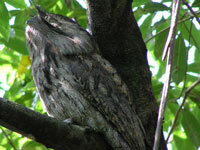 The Tawny Frogmouth is endemic to Australia, and is found throughout this sunburnt land. See our Tawny Frogmouth profile. 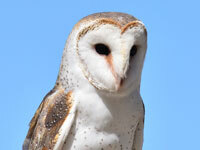 The Barn Owl is found throughout Australia and indeed on every continent in the world except Antarctica. Found throughout Australia, it is our largest bird of prey. The female of the species is larger than the male.